Last week was rough. Everyone caught the stomach flu which put a damper in my blogging and activity planning. Now I’m feeling refreshed, renewed and ready to tackle another week of fun activities! We had a busy bag exchange at MOPS (Mothers of Pre-Schoolers) last week. I came home with 25 different bags of activities to keep young minds and hands busy. 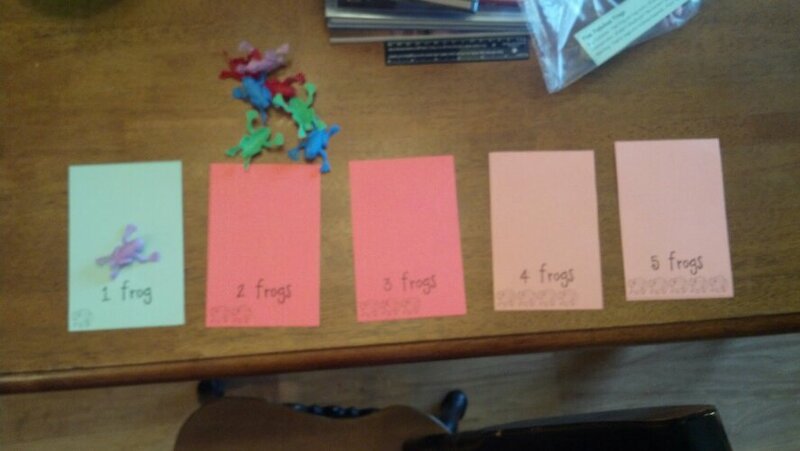 My contribution to the exchange was a game called Five Fabulous Frogs. Joe is going to love it and Jake will too. Sometimes, the best games are spontaneous and born of a desperate need to keep everyone calm and happy. We created a storytelling game that I call “Finish the Sentence”. I know, catchy. One of us starts a sentence, for example, “There once was a purple elephant who liked to eat…” Then, the other finishes the sentence with something like “…peanut butter and dill pickle sandwiches.” It makes for less whining and crying during car rides and waiting in restaurants. Joe has a lot of fun with it and has even been the one to initiate the game once or twice. 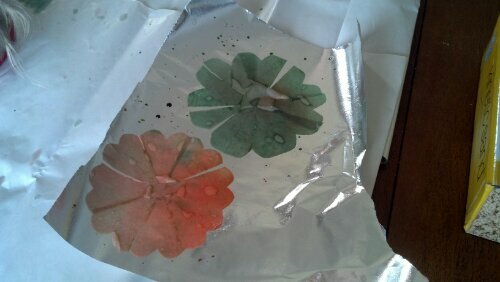 Another breakthrough last week happened when I was showing letter cards to Jacob. I held up and “H” and Joe said, “H, Ha-ha-ha”. At first I thought he was just laughing, but he did the same thing with “B, Ba-ba-ba” and a few other letters. In order to continue this learning trend, we will be fishing for letters this week. I’ll use the fishing pole from Joe’s magnetic puzzle and our magnetic letters. When he fishes one out, I’ll ask him what sound the letter makes. 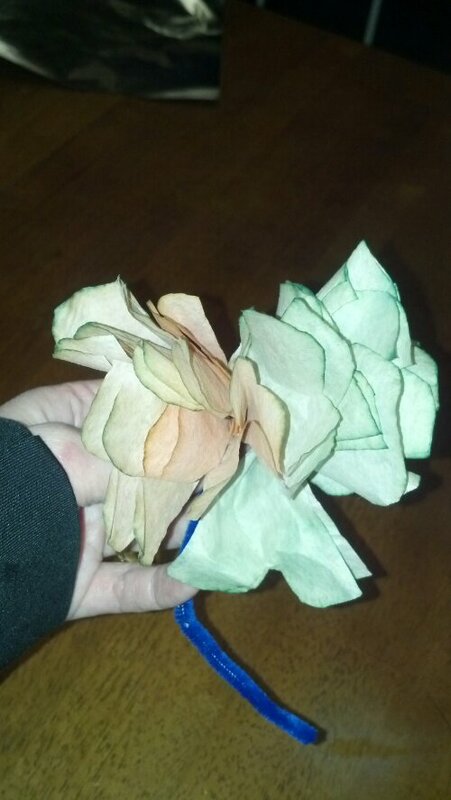 The coffee filter flowers were a big hit with both boys. 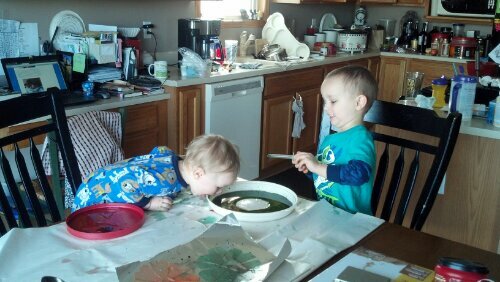 They did not turn out as colorful as the examples on the website, but the boys were busy playing with the food coloring for a good 30 minutes. This week, we will be making a water bottle fountain. In addition to the weekly “Taking Faith Home” bulletin from church, we will learn about and make our own Noah’s ark. Looks like another busy week.